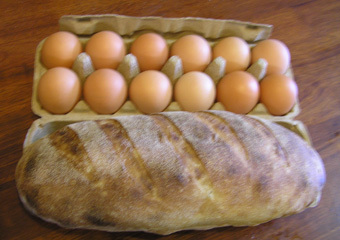 It’s sunny and beautiful at the market today. The blood oranges are gone, so we know winter is over, but where is the asparagus? Today’s market seems to be less about primary produce than usual, and there are more made products – several cake stalls, the pasta and pizza lady, a turkish bread stall, a salsa stall, to name but a few, and also a seedling stall, with lots of veggie seedlings for my garden. Of course, what my garden needs far more than veggies is for me to clear the bushland that is growing up in every garden bed. My first stop is the orange stall, just to see if there are any blood oranges left. Not that I need them – I still have a few on my fruit stand – but it’s a matter of principle with me. They don’t have blood oranges, but they do have blood orange juice – yum! – and pistachios, as well as their raisins, which always make me happy because they are still on the vine. 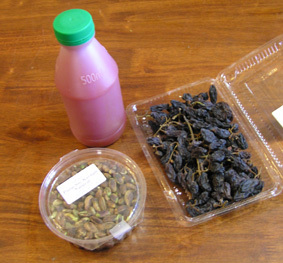 In autumn, you can buy the grapes and the raisins side by side, and I often do. The last thing I need right now is more oranges and lemons, so I leave it at that. 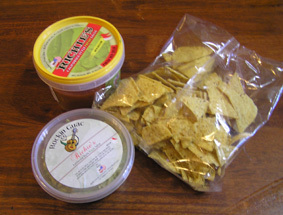 Near the orange stall is a stall-holder from California, with four different kinds of salsa, two kinds of guacamole, and home-made corn chips. We try everything. I really want to like the tomatillo and chipotle salsa, but I don’t, quite. Not enough, anyway. This time, we stick to a more standard salsa and some guacamole and chips, to go with the leftover vegetarian chilli we are having for lunch. The apple and pear stall has those tiny Sweet Blush apples that I liked so much last time, and also big Stewart apples for baking. I need to make a big apple crumble tonight for some week-day breakfasts, so I get a few of each. 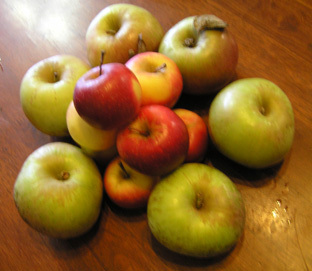 Herbivorous apples usually travel in herds, so that the juveniles can be protected by adult fruit. And then I get a little silly. 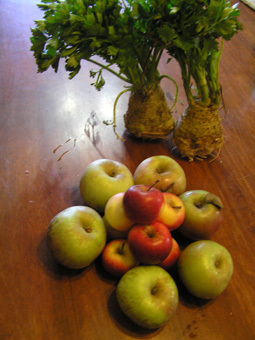 Celeriac are a major apple predator, however an adult apple can use its momentum to bowl the celeriacs over, allowing other members of the herd to escape. This action, fatal to both apple and celeriac, is known as ‘remoulading’. 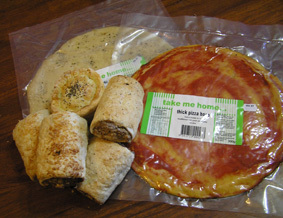 My friendly pizza lady is there today, along with a woman selling veal pies, veal rolls and veal sausages. With the Grand Final approaching, we need pies in the house, and of course pizza is a useful post-choir meal. I get some of each. Word at the vegetable stalls today is that there will be no asparagus at the market this year – the asparagus farmer has got tired of working on Sundays, and is only doing the really big markets on Saturdays – which we don’t go to. I am devastated – what is spring without asparagus? 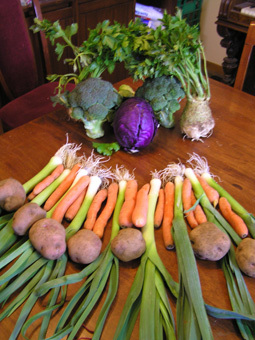 Fortunately, the vegetable stall-holder took pity on my distress, and has promised to get some from her friend, the asparagus farmer, and bring them to the market next fortnight. Her partner, seeing me making a bee-line for the teeny tiny leeks (which are possibly my favourite market vegetable at this time of year – at least when I can’t get asparagus) came back with a bunch of even tinier leeks as a freebie. I do like that stall. I can’t resist their lovely salad greens or broccoli, either, and their pumpkin is very vibrant – unusual at this time of year. 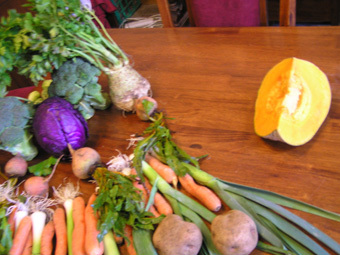 The next vegetable stall has celeriac, which I haven’t cooked with in ages, and new season golden beetroots – small enough to be manageable for a change! They also have the last of the brussels sprouts for the year, so I grab them, along with some baby carrots, because I can always, always use carrots. 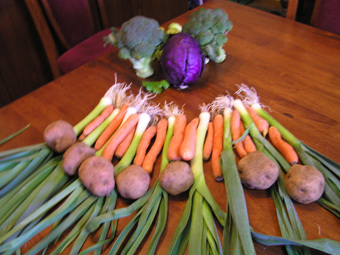 And, since we seem to be reaching the end of the winter vegetables, I get my last red cabbage of the year (and some pink potatoes from the stall next door). 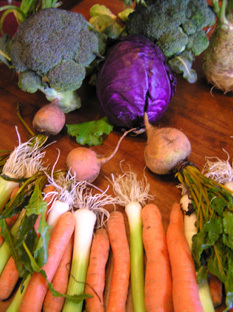 Adult brassicas are protective of their young. 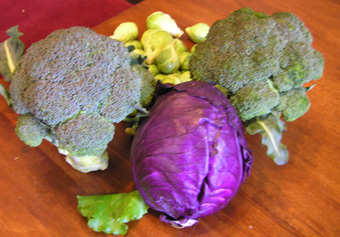 This particular family group is composed of one male cabbage (note the colourful plumage) and two female broccoli, and approximately two dozen of their sprouts. In a horrifying display of root-vegetable dominance, beetroot shock-troops stab the cabbage and broccoli with their roots. 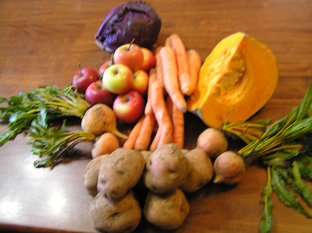 Empress Pumpkin Wedge, mastermind of the soup vegetable army, laughs triumphantly at the fate of the brassica herd. She will dine well tonight. v amusing – I would like to start cycling again in this glorious weather! 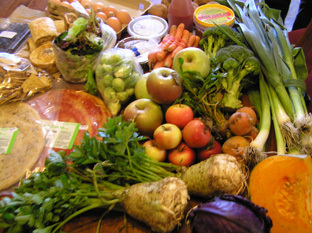 We got along to preston farmers market yesterday and there were blood oranges there – and lovely coloured beetroots and carrots – though no brassica herds or soup veg armies! 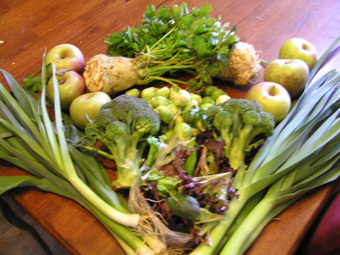 It was when I realised that I had little baby apples and big apples, and little baby brussels sprouts and a big parent cabbage that the brassica herds etc became inevitable. Preston market is fun! I’m sorry we missed it this month (I was helping a friend house-hunt), but I’m glad you enjoyed it. Do they taste significantly different to their larger sistren? Not hugely, but they don’t tend to have that woody core that a lot of larger leeks have. And they are so very cute!